About the author: John Su is an established skin care expert and aspiring dermatologist. He also runs a blog, The Triple Helix Liaison, dedicated to providing unbiased, meaningful, and insightful information about skin care. For his full bio, please visit our About pagepage. However, the metabolic pathway of this class of compounds isn’t as well-known. In this article, we’re going to focus on the main (and simplified) metabolic pathway of the naturally occurring retinoid, retinol and its derivatives. As you can see, it is a four-tiered process with several intermediate and complementary steps that like I said, will not be covered in this article. To be active, retinyl esters have to be converted to retinol (shown here). However, any retinol that is not used will be re-made into retinyl esters and stored within the skin. Retinyl esters are retinol molecules that have been bound to fatty acids, like palmitic acid. These compounds are quite ubiquitous in the cosmetics industry, appearing in products such as sunscreens, moisturizers, serums, etc. The two classes of enzymes that sever the bonds between the retinol and fatty acid molecules, are collectively known as retinyl ester hydrolases (REHs), but can be more specifically labeled as esterases and lipases. In vitro, it appears that human keratinocytes primarily express esterases ES1 and ES2, and a splice variant of hormone-sensitive lipase (HSL), in order to allow for the mobilization and hydrolysis of retinyl esters (3). A novel enzyme GS2 lipase has also been implicated. In the same study, it appears that the enzymes have a neutral pH optimum instead of an acidic one. Now, as only tretinoin (in this particular pathway) can bind to the various RAR and RXR receptors in skin, why is it important that we discuss the reverse reaction of hydrolysis, otherwise known as esterification? That’s because when human skin stores any excess retinoid, it does so in the retinyl ester forms, mainly because they allow for long-term stability and accessibility, due to similarities with the other fatty acids present in the skin (4). The main enzyme that takes retinol and binds it a fatty acid molecule via esterification, is known as acyl-CoA:retinol acyltransferase (ARAT), which has a pH optimum of 5.5-6.0 (5). Now, the above cited article is frequently (and incorrectly) used to justify that retinol products need to be in a 5.5-6.0 pH in order to optimally convert to retinaldehyde, because the enzyme responsible (acyl-CoA:retinol acyltransferase (ARAT)), functions best at that pH range. However, the process described is going in the opposite direction on the pathway of retinol metabolism shown above. The enzymes responsible for the conversion of retinol to retinal and ultimately, tretinoin are from classes of dehyrogenases enzymes, not ARAT. Therefore, it can be concluded that the citation was incorrectly used. However, that’s not to say that these other enzymes don’t also require a specific pH range to optimally function. Oh and just to confirm our findings here, other studies such as this one (6), also state that the hydrolysis reaction (towards tretinoin formation) occurs more frequently at a more neutral pH, while the esterification reaction (away from tretinoin formation) is functions best at an acidic pH (like 5.5-6.0). Why this happens is unclear, though some studies may provide further insight into this phenomenon. Retinoids are most active in the uppermost layer of the skin, the epidermis. However, studies show they have activity even in the deepest layer, the dermis. As this study indicates (7), when retinyl palmitate (RP) is applied to skin samples, the highest levels of both RP and retinol were found in the epidermis, followed by the stratum corneum, and the dermis. I’m postulating or guessing (since I can’t freely read the full article) that the highest levels of both RP and retinol were found in the epidermis because that’s where the first conversion step (with ES1, ES2, spliced HSL, and/or GS2) occurs. Consequently, the lowest levels of RP and retinol were found in the dermis because that’s where the retinol is converted to retinal and eventually tretinoin! It’s not that RP and retinol couldn’t penetrate into the dermis, it’s that they’re being converted to more biologically active metabolites in the epidermis! And it’s well known that tretinoin thickens the dermis, and the only way it could do that is if it actually reached the dermis. Of course I could be wrong, but it makes sense. This theory is also further strengthened if we look at the pH gradients. Esterification requires an acidic pH, and why would the skin go through esterification? 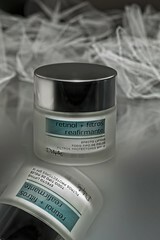 To store excess retinol in its ester forms. And where do retinyl esters primarily exist in the skin? The upper epidermis, which also happens to be the most acidic, to prevent infection, enhance exfoliation, etc. As we go deeper into the skin, the pH becomes less and less acidic, and more neutral, which is the pH that is necessary for retinol to eventually become tretinoin. With this theory, all of the different pieces come together cohesively, logically, and elegantly: the documented pH ranges, the layers of skin, and the functions of the vitamin A derivatives. I’d say that’s as close to an epiphany as we’ll get here! Again though, I could be completely mistaken. pH is important in skin care products. Retinoids have best activity at neutral or slightly higher pH. Acidic pHs are less desirable, but products should still work – just not quite as well as if they were at optimal pH. The classes of enzymes responsible for retinol to retinal conversion are from the cytosolic alcohol dehydrogenases (AHDs) and microsomal retinol dehydrogenases (RDHs) families. They do this via oxidation (8). Keep in mind that the word oxidation is simply stating that there is an overall less of electrons. It’s different than the oxidation that occurs in retinol degradation. So no, you can’t buy a retinol cream and leave it opened and expect it to magically become Retin-A. Ugh, if only. The pH range of RDHs appears to be quite stable between 5.0-7.5 (9). Though that is quite a widespread range, the studies that I have seen all use neutral pHs (around 7.0-7.2) to conduct their experiments, which indicate that a neutral pH is still the optimal one. It’s important to note that at this point, retinal can still be converted back to retinol and subsequently to a retinyl ester form for storage. After the next step, that can no longer happen, which suggests that this step is one of the most important rate-limiting feedback loops in the creation of tretinoin and of overall vitamin A homeostasis. Like any hormone, the mobilization, conversion, and expression of tretinoin need to be tightly regulated. Clearly this concept has been documented in other studies, which found RP to be 10x weaker than retinol (10), and retinol to be 20x weaker than tretinoin (11). Correctly functioning skin already has built-in “quotas” for each derivative. The third step is irreversible. Think of chemicals like a long line of people: Before this step, they could get out of line. After this step, they’re forced to wait until they get to the desired point. The classes of enzymes that are responsible for this conversion are from the aldehyde dehydrogenases, retinal dehydrogenases, and cytochrome P450-isoenzyme families. Without discussing each one in detail, as there are about 17 known forms (12), the most important thing for consumers like us to know is the appropriate pH range necessary for optimal conversion is around 7.1.-9.0 (13). Clearly, that range is too basic for the skin (the specified range was compiled from all retinal dehydrogenases activities measured throughout the human body). Therefore, it’s safe to assume that the most neutral pH range of about 7.1-7.2, which we’ve seen in previous studies done on human skin samples, is the most effective. Also, keep in mind that once this step occurs via irreversible oxidation, any excess tretinoin cannot be reduced back down the metabolic pathway. This may be at least partially responsible for why tretinoin can cause such potent side-effects such as erythema, scaling, and itchiness. Think of it like a super long charity line. Those who go past a certain checkpoint must wait in line until they receive money. In the meantime, they can’t go home, go the bathroom, and that can obviously drive them a little crazy. They might have to relieve themselves on the floor, or destroy the surroundings because of excess hunger, etc. Those actions of course, translate as negative side effects in our analogy. Similarly, the people in the previous conversion steps or “checkpoints” can still use the restroom and/or buy food. Well, that was certainly long. But hopefully, now you’ll have a deeper understanding of one of the most important biological processes ever! And for those of you who followed the previous advice of finding retinol products with pH ranges of only 5.5-6.0 and disregarding others, it’s not all in vain! As you can see from this article, while that particular pH range is a bit low (remember that something of a pH of 6 is 10x more acidic than something with a pH of 7) at least RDHs (one of the families of enzymes responsible for the conversion of retinol to retinal) appear to be quite stable in a pH of 5.0-7.5. And while the subsequent steps require slightly higher pHs, that’s only to function OPTIMALLY, which means that just because a product is NOT in the best pH range, doesn’t mean that nothing is being converted. The Peter Thomas Roth Retinol PM Fusion contains 1.5% retinol, one of the highest concentrations available on the market today. So in the end: Look for retinol/retinal products with a pH value of ~5.0-6.0. It’ll be neutral enough to allow for optimal conversion, without being too basic as to compromise the epidermal barrier. One more thing to take away from this is that like stated above, because tretinoin cannot be reduced to retinal, which can lead to unwanted irritation, going with a retinaldehyde or retinol treatment may be more effective if you have sensitive skin. Studies have shown that unoccluded (meaning applied directly to the skin and in the absence of any occlusive agents in the vehicle like petrolatum or dimethicone) retinol actually penetrates more effectively than either RP or tretinoin (14)! While it can’t be a complete substitute for its prescription-only relatives (which will be addressed in Part III), retinol products can be great alternatives. Please let me know what you think either down below or on my blog. I have a new discussion and routine review available too! Enjoy!